November 2 - 5, 2018 | Los Angeles, California 25 Years!!! The Hemp Industries Association has been Charting the Course for twenty-five years, and the stars are aligning for more opportunity than we could have predicted just four short years ago. 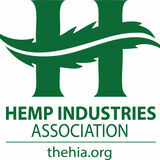 It is my great honor to welcome you to the 25th Anniversary Hemp Industries Association Conference in Los Angeles. HIACON returns to California after six years. The state is home to the most significant number of members in any one state and an ideal location to commemorate this silver anniversary event. 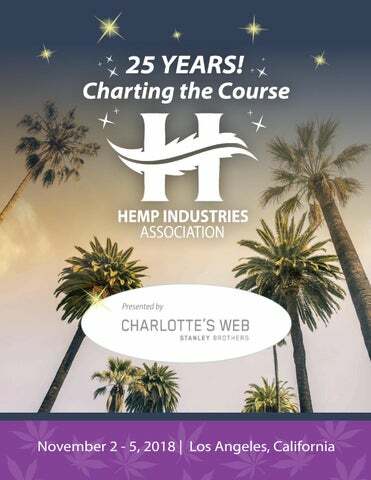 Some of the most dedicated and successful hemp trailblazers have called California home, and we look forward to honoring them during the 25th Anniversary Panel on Sunday led by HIA President and longtime member, Joy Beckerman. This year, HIACON is equal parts exhibition, education, and celebration. We expanded from four to eight education tracks covering the topics of Retail & Market, Health, Innovation, Law & Policy, Processing, Genetics, Agronomy, and Standards & Regulations. Be sure to venture to the Vape Lounge in the Malibu Garden courtyard to enjoy the California sunshine and network. On behalf of the Board of Directors and team, I’d like to thank all speakers and sponsors for their commitment to this event and to our cause. We will continue to push the boundaries for the industries’ markets. Another milestone is upon us next year. Hemp History Week will celebrate its 10th year in 2019, and we’ll be hosting an extra special kickoff event in San Diego. Now is a great time to join as a sponsor and participate in the HIA’s national marketing and education campaign. Mark Your Calendars for HIACON 2019 to be held in Charlotte, North Carolina at the Westin on November 1st - 4th, 2019. Please do not hesitate to engage with me, our team and our conference volunteers to let us know how we can ensure that you have a great conference experience. Hoban Law & Thought Leaders: Part I: California SB 1409: What You Need to Know Part II: The 2018 Farm Bill: What Happened and Where Is It Going? Cash Bar - Exhibit Hall Foyer Sponsored by Barlean’s, Hemp Road Trip, QC Infusion & Vitalpax Inc.
Colorado-based Cannopy Corporation, a seed-to-sale company, takes you from its 1000+ acres of commercial and high cannabinoid industrial hemp, to its newly-opened commercial whole hemp plant processing facility. The talk will include commercial-scale storage, milling, and pelletizing capabilities; food products and cannabinoid extraction facilities; and ﬂexible contract tolling agreements and add-on services. Including how it works in your body and how to choose a product you can trust. Full-Spectrum Hemp Oil available anywhere! DR. BRONNER’S SUPPORTS HEMP INDUSTRIES ASSOCIATION Seventeen years ago we became one of the hemp industry’s biggest supporters. We added organic hemp seed oil to our soaps: hemp’s omega-3 fatty acids give our soaps amazing lather and a rich moisturizing after-feel! Dr. Bronner’s is a founding member of HIA and supports Hemp History Week and Vote Hemp. Our goal is to source from American farmers the 20 tons of hemp seed oil that we use annually in our products. Shaving soap available in Peppermint, Unscented, Lavender, Lemongrass Lime & Tea Tree. Pure-castile soap available in Peppermint, Baby Unscented, Lavender, Almond, Citrus, Tea Tree, Rose & Eucalyptus. HEMP OIL IN OUR SOAPS IS GOOD FOR THE SKIN & PLANET Our products are certified to the strictest industry standards. Support truth in labeling! No greenwashing hype! brave and the coward, the brave has an ideal to fight for, such as teaching the Moral ABC, that unites the human race, in All-One-God-Faith! For we’re All-One or None! HEMP ACTIVISM AT DR. BRONNER’S David Bronner, CEO of Dr. Bronner’s, has been at the forefront of hemp activism, working to draw attention to the absurd policies that make hemp growing illegal in the U.S. From his action in 2009, planting hemp seeds on the DEA lawn, to his action in 2012—locking himself in a cage in front of the White House to harvest hemp—David has shown that it will take both lobbying and protests to make real change happen. The Colorado Chapter (formed in 2017), had some amazing victories this year including: the recognition of industrial hemp as an agriculture commodity by our legislature, the inclusion of carve out language that protects industrial hemp in the GW Pharma bill, identifying best practices for transporting industrial hemp, creating an online survey to gather information about the hemp industry from the hemp industry and the creation of the Hemp Feed Coalition to gain FDA-CVM approval for hemp in animal feed. We also formed a partnership from Eurofins BioDiagnostics that gives a 10% discount on ingredient and product analysis and creates a database of these lab results to be used by the hemp industry for approval of additional ingredients and quality standardization. With close to 100 members and growing the Kentucky HIA 501(c)(6) continues to be a leading voice in the development of the burgeoning Hemp Industry in Kentucky. To date, more than 70 processors/handlers have obtained licenses in the KDA pilot program. Processors have been working hard since 2014 to develop infrastructure with sufficient capacity to process hemp grown by farmers all across the region. The 2017 Processor Production Reports revealed that licensed hemp processors paid Kentucky growers $7.5 million last year and the creation of 81 new full-time jobs. The licensed processors also reported capital investments of $25.6 million and gross product sales of $16.7 million for 2017. NEW! Illinois HIA - Founded 2018 Taylor Schuck, President The Illinois chapter formed in 2018 is proud to announce the passing of the 2018 Industrial Hemp Act of Illinois. The ILHIA has submitted input on the Illinois pilot program’s rules and regulations that should be released on December 24, 2018. As we look towards 2019 we hope to help farmers and processors through the licensing process, create local cooperatives, acquire seed stock, and source or modify the necessary equipment to cultivate, harvest, and process industrial hemp in Illinois. Want to start a state or regional HIA Chapter? HIA requires a minimum of 15 in-state stakeholders, and we have additional requirements outlined in HIA’s Official Chapter Program Criteria. Email info@thehia.org for more info. Tennessee HIA - Founded 2013 Joe Kirkpatrick, President Tennessee became the first of all 50 states to approve the feeding of industrial hemp to livestock. We achieved this over the objection of the Cattlemen’s association and worked closely with the Farm Bureau to craft language that allows us to identify animal products as “hemp fed” as long as they do not commingle with the commercial food and feed supplies. We also fought off a hostile amendment that tried to undo what has become known as America’s best industrial hemp consumer products bill. Finally, welcomed the Southern Hemp Expo to Nashville, Tennessee, the south’s first ever hemp trade show. More than 3000 tickets were sold and the TNHIA held it’s first coordinated Farm Tour. NEW! New York HIA - Founded 2018 Joy Beckerman, President The New York Chapter just achieved formal recognition in mid-October, and we’re preparing for a year of building the hemp economy! Live-streamed monthly and special meetings that will allow members across the Hempire State to attend, along with educational supply chain events and the formation of committees to address specific needs are what’s in store for NY HIA members in 2019. NEW! Pacific Northwest HIA - Founded 2018 Formerly OR & WA HIA, now including Idaho Courtney Moran, President The Pacific Northwest Hemp Industries Association is pleased to announce the formation of the first regional chapter of the HIA. The PNW HIA represents members from Oregon, Washington, and Idaho. Our Board reflects the diversity of our geographic region and the many facets of our industry- an attorney, a grain processor, fiber manufacturer, retail product manufacturers, and CBD farmers. To date we have participated at several local conferences, including the Oregon Hemp Convention and the RAD Expo, and have submitted a letter to Congress recommending an amendment to the felony provisions included in the federal Farm Bill to prevent interference with our state hemp programs. HIACON - Conference Guide 2018 - 25 YEARS!